Good day sweeties! 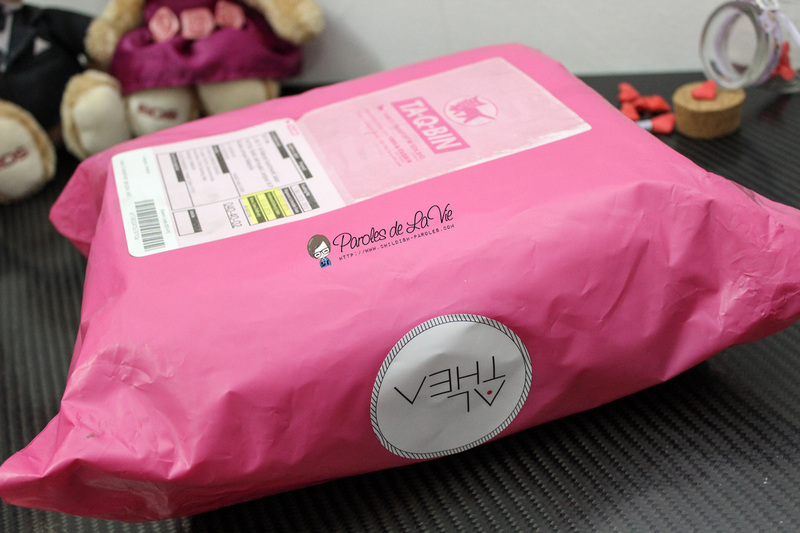 Can’t wait to share you on my beauty haul from Althea Korea which has just arrived yesterday! Before going into details, how much do you think I have spent on this round? Keep the answer first, I will disclose the answer at end of this post. I know some of you have not heard about Althea Korea yet. FYI, Althea Korea was officially launched on 1st July this year. It is a brand new online store, which sells Korean beauty products. Forget about counterfeited products, because they are directly ship from South Korea to Malaysia! The ordering way is similar to other online stores. Register an account, add products to cart and checkout. Thus, I am not going too much into details. The only difference is Althea provides another option for payment, which is via Paypal. I think, it is more convenient to shoppers. If you are thinking purchasing is more expensive since it is directly delivered from Korea, you are wrong. In fact, Althea offers shoppers with jaw-dropping price! 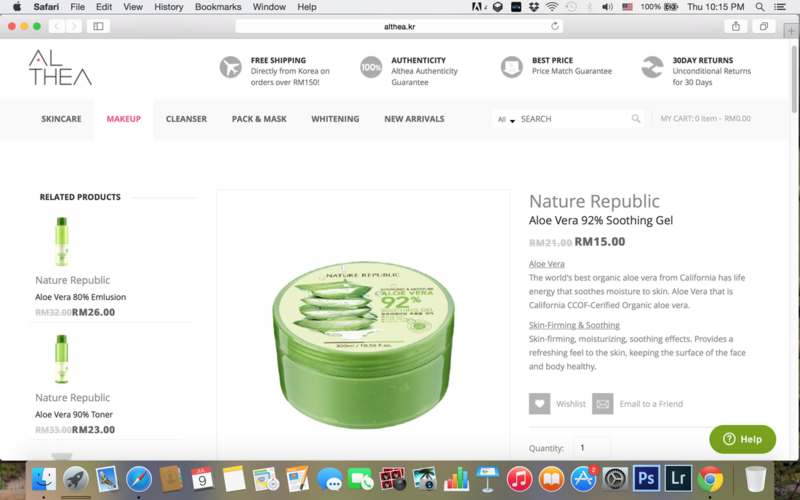 Based on my own experience, Althea is the CHEAPEST k-beauty online store! Check out the great deal below. Coming to the delivery, the expected parcel arrival is within 10 – 15 days. I ordered on July 1, received delivery notification on July 3, meaning that it only takes 6 days (including weekend) to reach my doorsteps! It is definitely exciting! And I am satisfied with the courier service, the staff was polite. He gave me a call, informing me when he is going to send me the parcel. The parcel was nicely packed, with layers of bubble wraps. It was an awesome shopping haul with Althea Korea. They treat their customers with 100% love and care, make sure every product reached in the finest condition to the shoppers. To be honest, I can’t wait to do more shopping with Althea. Before ending up this post, remember I ask you to guess how much I spend on this round shopping? The answer is RM136! It is super CHEAP! All items are full-sized. You can search for their normal price and you will agree this is cheap. Special deal as cheap as RM1 or buy 1 free 1 with discounted price every 3 days. Still can’t believe this awesome online store? Check it out yourself now! I tried my luck to get this review but not selected. This is one alternative for those Korean beauty junkies. Love you shopping haul!!! So do I. But I wasn’t lucky enough to get that too. However, I still blog about it because Althea is really great! Such a lovely place to shop for Korea beauty stuff… I’m gonna start browsing and getting my own stuff now.. hehe! Yeah. You will love it soonest! I always wanted to try nose pack sheet but but I end up I purchase other products T.T Let me know if it is nice!! Haven’t try it. Let you know how it works after i use it. Yeah, it seems like we are dreaming. I just received my parcel too! It really is super awesome 😀 wish they had more brands to choose from, i’m pretty sure they’ll someday be one of the top sites for korean beauty brands! Same here. Wish they can have more brands. Yes. This is the BEST haul I had. You’re right, they are cheap. What are the Tint marker and Tint Water you bought? That is for lips. I still haven’t try it out. Curious how will it help to improve my makeup. I’ve heard of Althea somewhere before. It looked really worth it! Yes. Almost all beauty bloggers i know talked abt it too. Aloe Vera for RM1!!! My next Q, is it authentic? But RM1!! Even the others is very very affordable! Thx for sharing~! Yez! It is. RM1 is because of the special deal for 3 days. Now it is other products. Check it out and you will know it. Haha. Because she knows this is cheap! I am so happy when I found Althea. The products will be shipped directly from Korea and it gives us a confident to shop with Althea. Yes. So do I. Love them a lot. Mine didn’t leak. But the mask is so watery. seems like they have really fast delivery! Nice one! Yes. They are. I love a lot! Thanks Tammy. More comments from readers now. Some are from SG. They are excited about Althea too. They are curious when Althea can ship to SG. hey that is not bad at all! In fact, very affordable – I’m in if they ship to SG! Hope they open delivery to SG soon. Looks like a pretty good set. 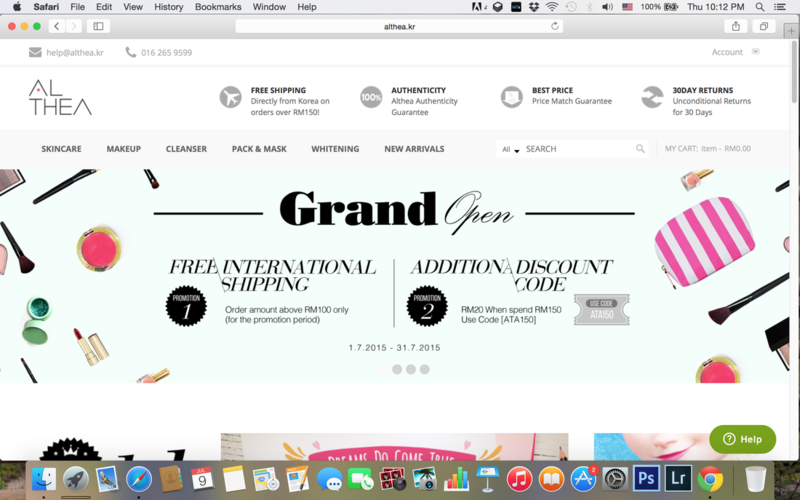 Interesting how they now have an online store exclusively for Korean beauty products! Just so many of them. That is a good deal online. Buy 1 free 1. And they ship internationally. I will check their online shop soon. Thanks! Check it out soonest! You will love them! i checked it out babe and aghhh! 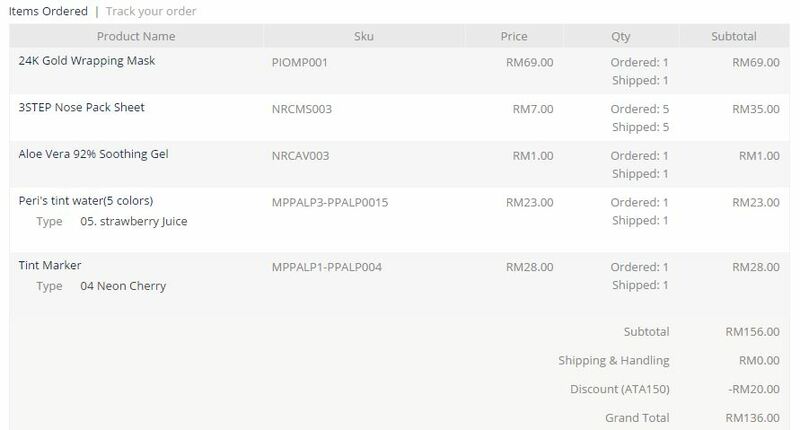 They only ship to Malaysia at the moment!! So ship to SG soon! The price is really good, especially for Laniegh! They are still new, less than a month old. So give them some time to grow stronger! Yup, this is the first time I’m hearing about Althea Korea. But what I do love about it is how we can purchase authentic, Korean skin-care products. There’s been an increasing demand and love for Korean skin-care products and there have been various products coming out. It’s scary to just purchase anything from shops so it’s good that Althea Korea has its stuff online. If you are a fan too, you will love this website! Im a fan of Korean beauty products. It’s good to know that I can easily access them now through this shop. Then you must check out Althea! This is a heaven for K-beauty products fan! They ship worldwide actually. You can order from them. I ordered from Althea Korea also, my parcel reached in less 5 days and all in good condition. It’s a great bargain. Ha! That’s why we love. Cheap price and fast delivery. I too heard that Althea products are wonderful and got to hear from many friends that specially korean face pack do wonder to skin. Awwww… that’s great! Recommend to more friends who don’t know Althea! They will love it, I am sure! Yes. Even we can find some brands at counter, but the price is quite expensive. With Althea it is Cheapest! It’s nice that they have more options when it comes to modes of payment. It’s also great that they offer them at really reasonable prices. Not only reasonable but also cheap! Yes, first time to heard about this online shopping site. Seems a good one to find Korean products. Yup, becaise they are new! Based on Korean’s beautiful skin, I think that they have the best beauty product around. I can’t wait to spread the news about this new site to my friends should they visit. Must spread this awesome news to everyone you know! Ya. I did. Going to post my review about it soon. Awww… I see. But how about credit card or debit csrd. Guess you can just register a paypal account and link it to your card. You don’t necessarily to topup into paypal.